Emco Precima Engineering Pvt Ltd.
For 21 CFR Chapter 11. For RF and Wireless Operation Via Blue Tooth. -Use in locations where wiring is not possible. 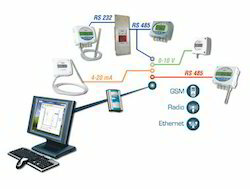 We believe in quality product, keeping this in mind, we manufacture multi featured Climate Control Software for integration of all transmitters, data loggers and sensors into one single Master Control. We manufacture these products by premium quality raw materials. You can minimize your cost by using the complete system for monitoring. HVAC applications offer up to 65% of energy savings. We offer free installation facilities to our clients. Looking for Climate Control Software for Data Loggers and Transmitters ?